WHITE ROCK, BC / ACCESSWIRE / October 22, 2018 / Orsu Metals Corporation (TSX-V: OSU) ("Orsu" or the "Company") announces completion of the extended 2018 exploration program at its Sergeevskoe Gold Project in Russia. The program is designed to deliver an estimation of a maiden resource in Q4 2018. Dr. Alexander Yakubchuk, Director of Exploration of Orsu commented: "We completed the extended 2018 exploration program and are now working on delineation and correlation of the mineralized intervals, while some assays are still either pending or the samples are on their way to the analytical laboratory. Orsu believes that the results from 17,107.9 m drilling and 5,293.5 m trenching by the Company in 2017 and 2018 will form a solid foundation for the forthcoming resource estimate". 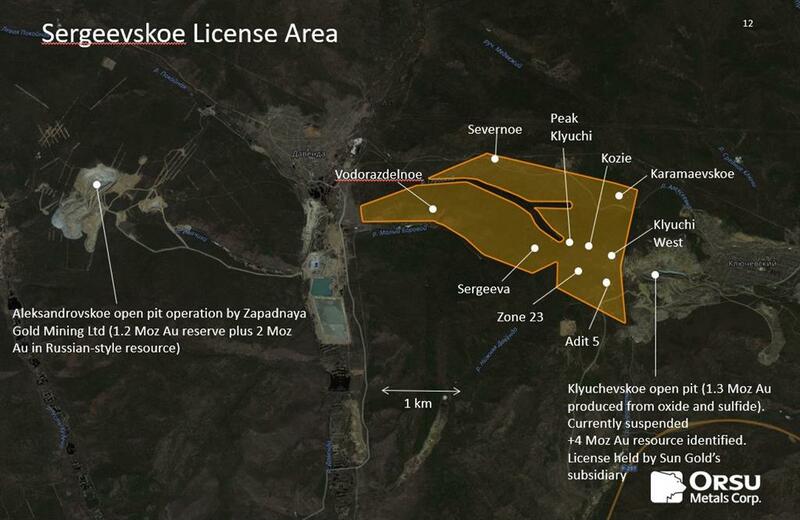 The license of the Sergeevskoe Gold Project occurs immediately east from the Alexandrovskoe open pit and plant owned by Zapadnaya Gold Mining Ltd and to the west from the Klyuchevskoe license owned by Sun Gold Mining (Figure 1). The Klyuchevskoe (Klyuchi) gold deposit represents a +6 Moz gold endowment (see Orsu press-release dated September 21, 2016). Orsu owns a 90% interest in the Sergeevskoe Gold Project (see Orsu press-release December 1, 2017). In May 2018, Orsu announced the beginning of the 10,000 m drilling and 2,000 m trenching program (see press release May 2, 2018), aiming to deliver an estimation of a maiden resource and to test new targets. This program was then extended to drill additional 2,000 to 2,500 m to fill in gaps in the existing grid and to drill additional targets (see press release September 20, 2018). 1 Business Standard, a leading Indian daily newspaper, reported on 21 September 2018 that "Chinese company China National Gold will invest about $420 million in the development of the Klyuchevskoe gold deposit in Russia, while another $65 million will be invested by India's SUN Gold. The annual production volume is expected at about 6.5 metric tons of gold per year, the Russian Industry and Trade Ministry reported." Figure 1. An outline of the 7.6 sq km Sergeevskoe license area with location of principal gold prospects and two adjacent open pits. On October 17, 2018, the Company completed its 2018 exploration program, with all equipment demobilized by contractors. In total, Orsu completed 13,463.8 m in 62 diamond drill holes (including 2 holes re-drilled in oxide) and 1577.8 m in 14 bulldozer trenches in 2018. The program was done on time and on budget. For resource estimation purposes, this can be supplemented by the diamond drill holes and trenches of the 2017 exploration program. During 2017 and 2018, the Company collectively drilled 17,107.9 m in 82 holes and trenched 5293.5 m in 44 trenches (Figure 2). All drill holes and trenches were completed within a 1 sq km area in the southeast of the Sergeevskoe license at Zone 23, Adit 5, Klyuchi West and Kozie prospects, with scout holes drilled at the Sergeeva and Peak Klyuchi prospects. Figure 2. A satellite image showing position of drill holes and trenches completed by Orsu in 2017 and 2018 in the southeast of the Sergeevskoe license area. Holes were drilled in fences spaced 80 m. Within them, the vertical distance between the mineralized intervals in individual holes was designed to achieve 80 m. All holes were angled holes, with dip varying from 50 to 70 degrees. The average drill depth was approximately 220 m, with individual depths varying from 18 to 421 m. This drill density is expected to qualify for an Inferred resource category. 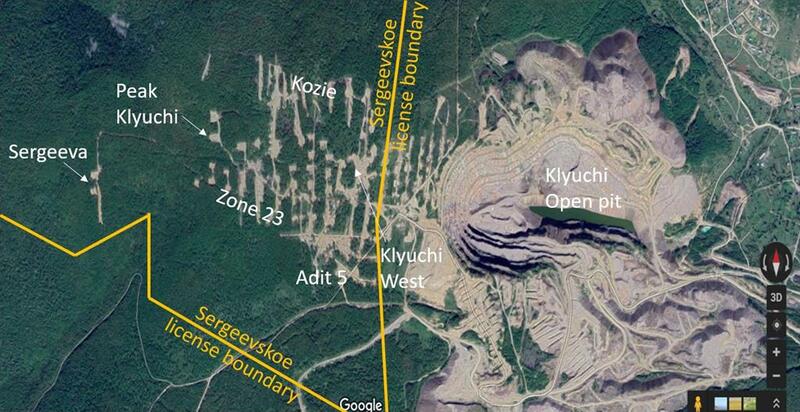 In addition, five drill fences at Zone 23 and three fences at Klyuchi West were drilled 40 m apart. Orsu expects that these areas will be classified at higher resource categories. Thorough QA/QC protocols are followed on the project including insertion of duplicate, blank and standard samples in all trenches. Duplicate samples were inserted after every 20 samples. All standard samples were inserted once per 20 samples. Blanks were also inserted once per 20 samples and consisted of the previously assayed barren granitoid rocks. Drill core samples were submitted directly to the SGS Vostok laboratories in Chita, Russia, which are independent from Orsu, for sample preparation and analysis. Analysis for Au is performed using fire assay method with atomic absorption ("AA") finish and with a gravimetric finish for samples exceeding 10 g/t Au. Results published are from the gravimetric finish if above 10 g/t Au and from the AA finish if lower than 10 g/t Au.